There’s this thing that I do: I spend every period of the twins’ little lives mourning how big they are now, how much they’ve grown. And I forget how small they still are, how they still fit in our arms, how they still have gummy grins and baby babble and cankles. I forget. I look at their photos and all that I feel is sadness for the tiny babies that we will never know again, but those tiny babies aren’t dead, they’re right in front of me grinning and waving their arms and ready for a game. They’re not lost, not really – they’re just grown. And they’re still so little really, there’s still some babyhood left to enjoy and a whole expanse of childhood stretching out in front of us. What prompted this realisation? I blame the ghastly weather, which has driven us to seek new entertainment within the house. 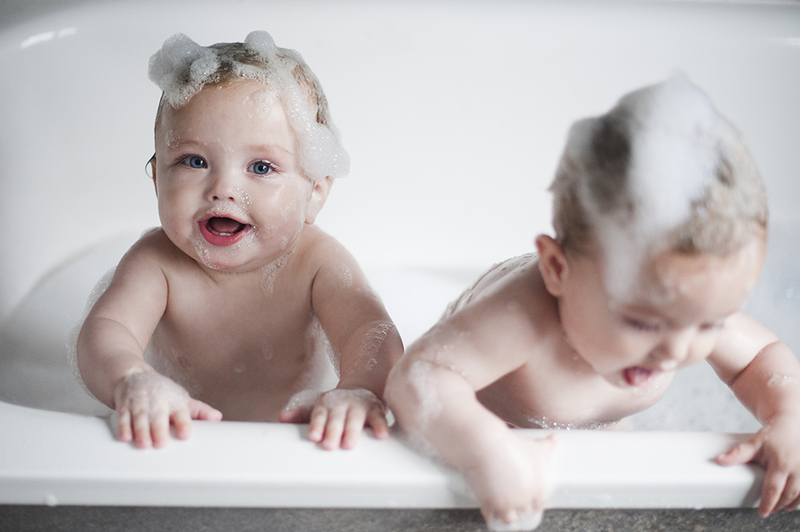 A bath is one of my favourite ways to pass a loose thirty minutes and it seems that the twins have inherited my love of water; they love to practice their splashing, to chew on their bath toys, to flip suddenly onto their fronts and splutter dramatically until they are rescued and righted. We have a lot of fun. 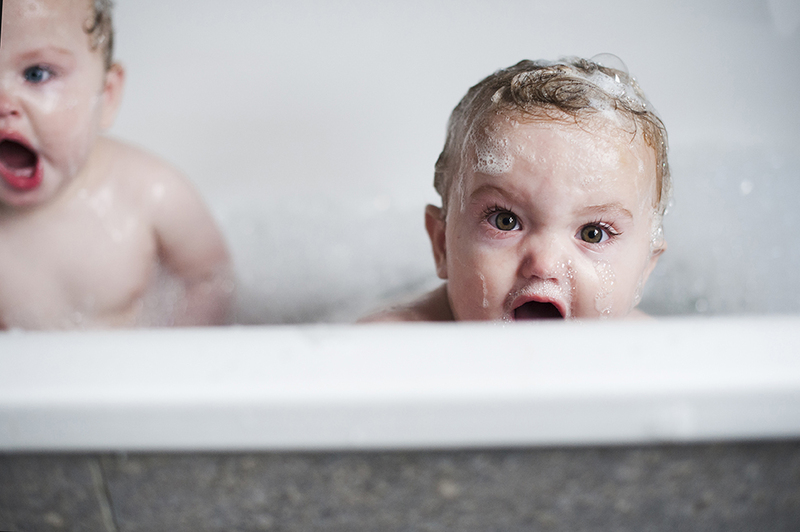 So they took a bath, just an ordinary moment in their day, and I took my camera, and we captured the experience. 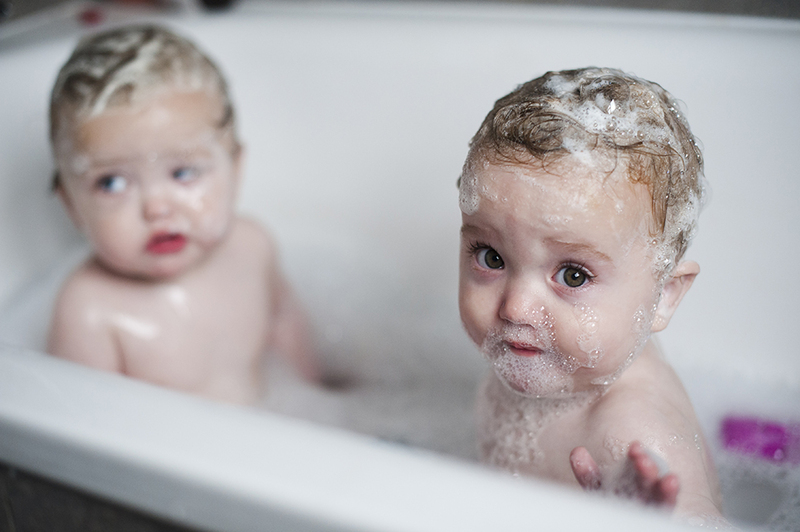 It’s not the first series of photos of the twins taken in this bathtub and I worried that the images would be samey and boring – but then I looked at my old pictures and the difference between my babies then and my babies now took my breath away. I could go on about it again. They were so small (and in comparison now they’re so big). But at the time I thought that they were enormous, giant babies, the least baby-like babies in the world. It’s funny how the mind works. I remember looking at those pictures and grieving, actively grieving, my newborns but look at them, how small they were, their funny old-man hairlessness in comparison to the babies that I have playing about my feet now, the babies in the pictures above. What am I going to do about it? I’m going to enjoy the moment. I’m going to take the time now to cherish the children that I have now, the family that we are right now. Look at my babies, my perfect little babies. Look how they laugh with us, how they check our expressions to see how they should react, how innocent they are. 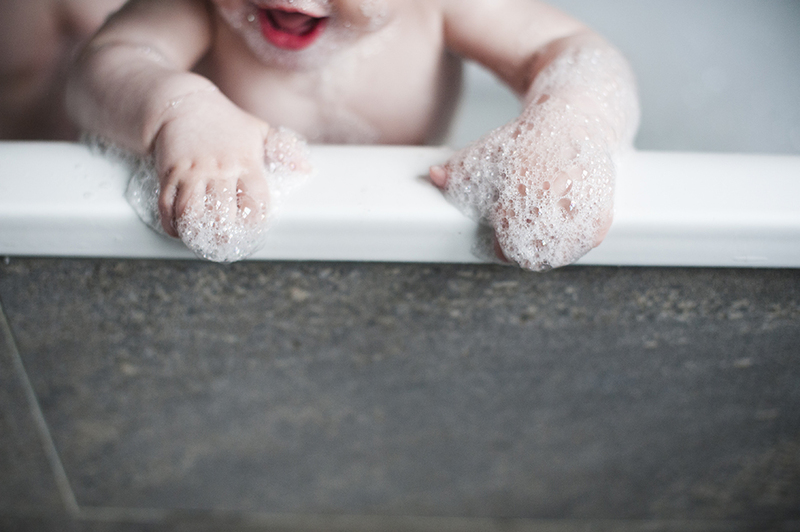 I will put them back in that bathtub and as they splash, enjoy the littleness of them; those plump baby cheeks, the ringing of their laugher, the bodies that I can still lift easily from the tub and snuggle close against mine. My babies. Still so sweet, still so small. I am going to enjoy them as they are today. These are gorgeous photos! To me, these two are still teeny tiny but I do have an 8 year old and a 6 year old LOL. But I get what you mean about them seeming big to you now compared with weeks or months ago. Enjoy the moment is a great attitude to take, especially when it comes to our children. I’m sure you have heard it before and are starting to realise this but they grow up so fast. They are still so small, so baby – you wait until they are running around like my crazy monkeys! I know what you mean about enjoying the now though, and in hindsight you always wish you had spent more time enjoying them just as they are. Beautiful babies & stunning photos. You’re very talented. Babies grow, but it looks like you’re enjoying the journey. I love this post; it reminded me of how sad I felt each time they grew out of the next age of clothes – now they’re bigger I forget how much they changed all the time as a baby. Beautiful children you have.